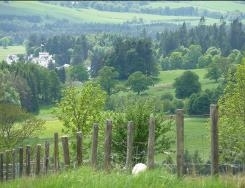 Welcome to beautiful Tulach, in the heart of Highland Perthshire near Blair Atholl and Pitlochry. 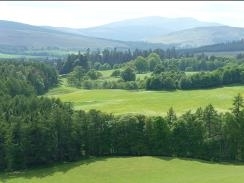 Tulach is newly refurbished with outstanding views over an idyllic rural location and fabulous open fire. Welcome to Tulach, from the Gaelic meaning 'hill'. 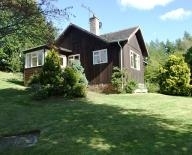 Tulach is a detached cedar wood chalet-style cottage with two bedrooms - a double and a twin. We have just completed a fantastic refurbishment over the winter of 2015/16. We were always proud of our cosy cottage but we have made changes that enhance the views and have upgraded throughout. Soak in the views from our beautiful extended eat-in kitchen with large windows - with a coffee in the morning and perhaps a wee dram in the evening. The kitchen is fully fitted with dishwasher, washing machine and microwave. The living room benefits from an open fire, double aspect picture windows, comfy sofa, wifi, TV with satellite channels, DVD (you will find a selection of DVDs and books with a Scottish theme). The views from the living room are also wonderful. A beautiful hard wood floor runs throughout the cottage but is complemented by warm rugs and soft furnishings. The bathroom has also been upgraded, featuring a brand new suite and gorgeous 'Naranja' tiles (as seen on Grand Designs). Outside, there is a large garden with a table and chairs for al-fresco dining in the summer. A barbecue and picnic blankets are also available. Children are very welcome, and hopefully they will spot some red squirrels in the garden! Pets are also very welcome. The wildlife in the garden can be quite exciting at times, but usually friendly - as well as red squirrels we have seen deer, grouse and pheasants. Our guests have reported many sightings! A welcome pack of essentials to get you going is provided, something we have always appreciated on our own travels. We are now in our sixth season and have really enjoyed welcoming guests to our lovely cottage, set in a truly fantastic location with glorious scenery and fabulous views to the west. We have always tried to ensure that the cottage is well equipped and welcoming with special touches - you will even find a set of antlers in the living room! The refurbishment over the winter of 2015/16 has made Tulach even more special. With our extensive local knowledge of the area, we can also offer suggestions and ideas to help you make the most of your stay. We already have a Visit Scotland 3 stars grading. The immediate surroundings are amazing - try a quick walk up the road and revel in the views. There is a river close to the house (across the road and down a little) and you can walk around here too but please watch children carefully at all times as the water is fast flowing. We are also very proud of our bespoke walking guide, prepared by Jennifer's father who has scaled a very large number of the Munros in Scotland. To ensure a great day out, picnic blankets and picnic equipment are provided. 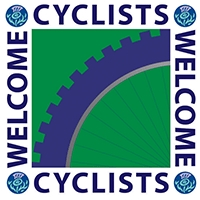 We are now part of the Visit Scotland Walkers Welcome and Cyclists Welcome accreditation schemes. Walking is not the only pursuit to enjoy here of course, and we will do our best to help you make the most of your stay. 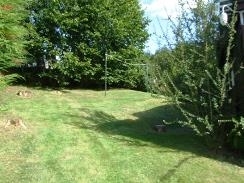 Or you may simply just want to relax in the cottage or garden. Don't forget to look up at the sky at night - you won't believe what you can see on a cloudless night!